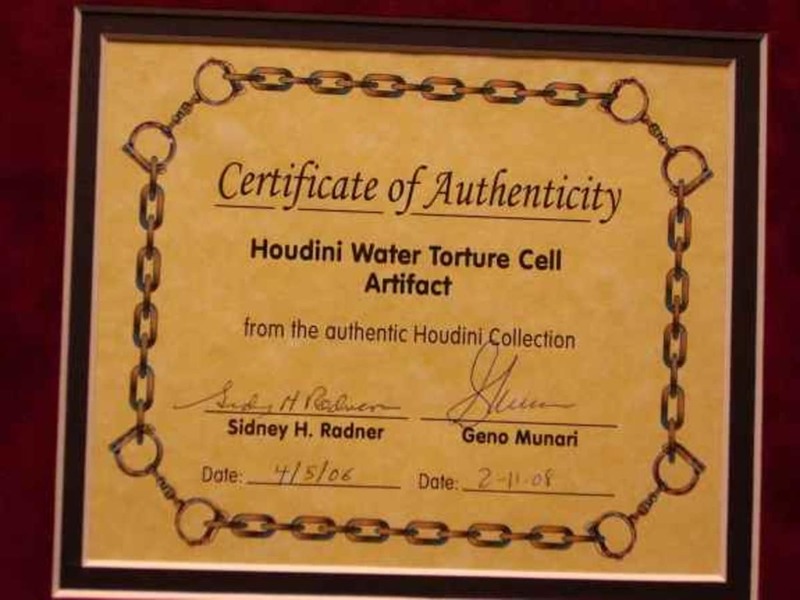 Houdini's Chinese Water Torture Cell was used from 1912 thru his death in 1926. The Chinese Water Torture Cell became his legacy. He was lowered, upside-down, into a formidable contrivance of steel and glass through which he said "good-bye" as the curtain closed. But he would emerge within minutes, as always, with the water filled chamber intact and standing next to it. Although other models were made over a period of time, the only surviving chamber, 5'h x 2'w, was sold at auction to magician David Copperfield. The chamber is made of a glass front enclosure with three wooden sides with edges and corners made of brass and chrome plated fixtures and four caster wheels on the bottom of the chamber enabling the chamber to be moved around. The wood parts were burned in a major fire in 1996 at the Houdini Magical Hall of Fame, Niagra Falls, Ontario, Canada and was restored in 2000. The glass was from the original spare replacements panes. For more information on the Chinese Water Torture Cell please check out this page here. Contact us for more information on our wide array of Houdini Collectibles, both original and replicas.